Yes! We have a couple quads that can take a few peeps up the first 5 miles. Then it's a 2 mile hike up to the meadow. It's roughly 3400ft of climbing to ride the entire out & back up to the meadow. Yep, camping is allowed. Subject to USFS dispersed camping rules. 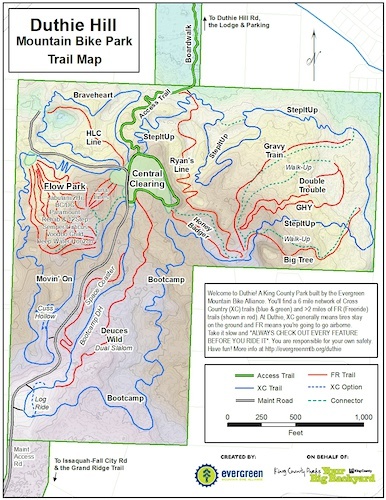 Once the network is complete, an awesome overnight trip will be to take the clockwise loop up to Harlan Saddle between Alpine Baldy and Beckler Peak, ditch the bike and pack, hike west up to Beckler Peak (hiking only), come back down, grab your sh-t and bike up to the AB meadow, then down to the 5-mile campsite, spend the night, then out & back to the meadow again in the am, and then all the way down to finish the CW loop. @swartzie: We are working very close to the Wild Sky Wilderness boundary, but not actually in the wilderness. The ridgeline above us (north and east of us) is the boundary line. 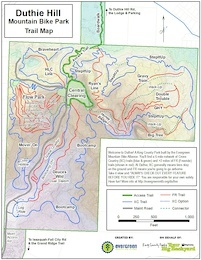 The original trail proposal called for an out&back addition to Jakes Lake to the north. The Wild Sky bill killed that idea. Should still lobby for a hiking trail to the lake IMHO. Posted in "Duthie trails closed until storm clean-up complete"